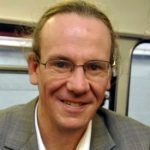 This year’s itSMF UK Annual Conference (ITSM18) was suitably thought provoking across a range of areas, but one that is of particular note was the significance placed on mental health. In IT service management (ITSM) we’re used to grappling with value and how we improve focus on it. This theme recurs. However, we’re not so used to mental health being mainstage. James Finister had flagged this in the summer with an impassioned plea at the Professional Service Management Awards, but we’ve not really heard much talk of it beyond that, until ITSM18 keynote speaker Thomas Jordan (TJ) from SANE gave a clearly articulated message about the impact of mental health issues on everyone – in both business and our personal lives. And, throughout the conference many other speakers linked back to this thread. On one level this seems a big shift, but on another it’s simply waking up to the implications of what we’ve been saying all along. Conference after conference says that people’s importance is underrated. If this importance isn’t properly recognised, then maybe we shouldn’t be surprised then to find that there’s some fall-out. John Terry picked up a “Respecting People” theme. Like James and TJ a family/friend’s suicide had highlighted how seriously wrong things can go. John recommended a focus on building a supportive team environment and giving the opportunity for people’s intrinsic motivation to power their productivity. Treat people better and get better results for the employer than a more traditional carrot-and-stick approach, and happier staff too. Sounds like it should be a no-brainer? Respecting people isn’t just about staff though. Customer experience, which has had increasing focus, is, at its core, about respecting the people who will use your services. Alice Doyne explored the implications of this on how we design those services. Less ‘service design package’, more engagement with the people who will use these services (and I personally look forward to hearing more about bringing the two together). Lorraine Brown also talked about her experience in an organisation where there are more people working on customer experience than they have developers. So, if you take people seriously there are wide ranging implications. However it’s relevant to focus on how employers treat their staff. This is likely to translate into how other people are treated as well. 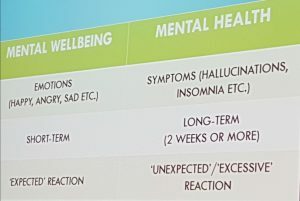 TJ focused on the difference between mental health and general wellbeing, pointing out that there are natural short-term reactions to the things that happen to us which are different to longer term conditions. Both of these matter. There’s a lot of pressure to perform within a general expectation. To caricature a little, you’re sat chained to your desk, delivering to SMART objectives, being expected to do more than your hours, always being ‘fine’ if anyone asks how you are, only off sick if at death’s door, and always embodying your company’s relentlessly positive values. But what happens when life isn’t going so smoothly? How supportive is your employer then? Given that the organisation I work for is involved with clinical research, and that mental health is part of that remit, it shouldn’t be a surprise to find that it’s a generally supportive environment. One thing I’d like to highlight is an initiative that was started about 18 months ago called “Wellbeing Warriors”. We’re a hierarchical organisation, but this is a non-hierarchical initiative which has senior management support. People were asked to volunteer to help take a wellbeing agenda forward, and are given time by their line managers to allow them to do so. As a group they’ve produced monthly blogs, sought to engage with staff for ideas, helped to provide a wellbeing focused perspective within All Staff events and generally highlighted wellbeing related practices, such as thanking colleagues. Senior management have provided interviews, given the group space and the support of a senior representative within the group, but not dictated what it does. As well as making it easier for people to talk about their mental health it gives a sense of there being permission to do things that benefit your wellbeing. It’s also a lived example of self-organisation which involves senior and junior people working together outside the hierarchy. Overall it models treating mental health seriously. Whether an initiative like this would make sense in your organisation or not, maybe now is a good time to look at whether your organisation supports the mental health of its people and whether more needs to be done.